Skiers are particularly prone to blisters. Any excessive moisture on a skier’s foot will lead to friction and, in most cases, the formation of blisters. Whilst a blister might seem like the most minor of injuries that a skier could incur, even the tiniest blister can cause great pain, sometimes preventing sufferers from returning to the slopes. Blisters, too, can become infected. For these reasons, it is important to know both how to prevent and care for blisters. When it comes to prevention, keeping your feet dry and warm is vital. Blisters can be avoided, for the most part, by opting for good quality, expertly designed equipment. Keep clear of ill-fitting ski boots. Boots should be a snug fit; neither too loose nor too tight. Take the time to try on a number of different boot styles, as you are likely to be wearing them for around seven hours a day and comfort is a must. Invest in a pair of ski socks that will ‘wick’ moisture away from the foot. 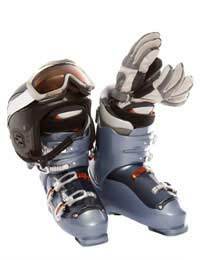 Ski socks are often made from wool or silk but synthetic materials such as acrylic, nylon and polyester are also common. The sock’s inner layer takes the moisture away from the foot, whilst the outer layer helps to evaporate it. As well as combating moisture, good socks will help to keep your feet warm and comfortable, reducing the risk of blisters. Never wear multiple pairs of socks and never opt for regular cotton socks. Do not tuck your trousers into your boot, as this may cause your feet to perspire more. Some skiers find applying petroleum jelly or running lubricant to blister-prone areas especially helpful. Others swear by orthopaedic felt. Purchasable from most chemists, the felt can be attached to the skin, or to the inside of the ski boot and works to relieve pressure on sore areas of the foot. Avoid popping blisters wherever possible. There are cases, however, when swollen blisters prove so bothersome that they interfere with everyday activities, or with the sufferer’s ski schedule. In these cases, blisters can be popped with a sterilised needle or pin that has been plunged into boiling water or treated with rubbing alcohol. The trick is to insert the needle gently into the side of the blister. Do not squeeze. Instead, let the fluid flow from the blister. Take care to wash the area with soap and water. Next, apply an antiseptic liquid with a clean piece of cotton wool. Finally, cover with a bandage, gauze or plaster in an appropriate size. Blisters can be a real nuisance, so don’t let them ruin your ski break. Avoid taking home a serious of painful, unwanted souvenirs by arming yourself with well-fitting ski boots, a quality pair of ski socks, orthopaedic felt, running lubricant, antiseptic and a selection of plasters and bandages. Become an expert in preventing and treating blisters and you are sure to save yourself from pain, discomfort and inconvenience both on and off the slopes.